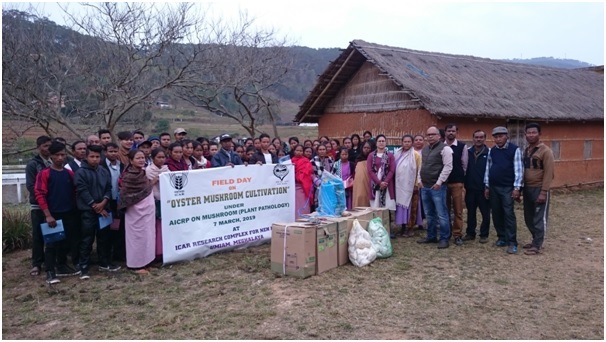 Field day on Oyster mushroom cultivation was celebrated on 7th March 2019. Field day on Oyster mushroom cultivation was celebrated on 7th March 2019 at Plant Pathology, ICAR Research Complex for NEH Region. Around 52 farmers from Jaintia Hills and nearby areas have shown keen interest and have gathered to participate in this programme. At the outset Coordinator Dr. Pankaj Baiswar expressed his gratitude to all the farmer friends for showing keen interest. He also informed the gathering that Farmers income can be doubled in a short span of time using mushroom cultivation especially oyster mushroom cultivation since this is the easiest mushroom to cultivate and it can be cultivated round the year. A demonstration along with hands on session for farmers was also conducted to boost the confidence of farmers in cultivating oyster mushroom. A session on interaction with farmers was conducted to answer the queries of the farmers related to mushroom cultivation. Various inputs like knapsack sprayers, mushroom spawn etc. were also distributed to the beneficiaries. The programme was coordinated by Dr. Pankaj Baiswar, Dr. Tasvina R. Borah and Dr. H. Rymbai.